Population- 79.8 million (It is the province with the highest population density in China, except municipalities of Shanghai, Beijing and Tianjin). 3. 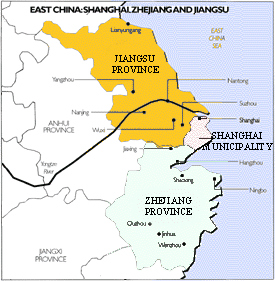 There are 13 municipalities under the jurisdiction of the provincial government, namely, Nanjing, Wuxi, Xuzhou, Changzhou, Suzhou, Nantong, Lianyungang, Huai'an, Yancheng, Yangzhou, Zhenjiang, Taizhou and Suqian. Under these municipalities, there are 52 counties or county-level cities. The capital of the province is Nanjing. 5. Punjab Chief Minister, Shri Prakash Singh Badal visited Wuxi, Jiangsu in November 2014. He along with his 17 member delegation had meeting with the Party Secretary of Wuxi. Punjab is also in discussion with Jiangsu for a sister city agreement. Punjab Government has signed three MoUs with Jiangsu in the field of fisheries and aquaculture. BRICS Agriculture Ministers meeting was held in Nanjing in June 2017. The meeting was represented by Secretary Agriculture from India. 7. The principal items of import from Jiangsu to India were mechanics, electric devices and its components, chemical industry and the products and base metals and its products. The main items of export from India to Jiangsu were chemicals, textile raw materials and products, mechanics, electric and its components. 8. By the end of December 2015, there are 64 companies approved by Jiangsu to set up overseas companies in India, in which the Chinese contract investment reached the amount of US$132 million. Companies from Jiangsu are doing business with a large cross section of Indian companies in various sectors such as power generation, mining, chemicals, infrastructure development, auto components etc. This includes Isola Laminate Systems(Suzhou) Limited, JOC International Technical Engineering Co. Ltd. (JOC), Jiangsu Jinpeng Power Station & Transmission Electricity Engineering Co. Ltd., CSR Nanjing Puzhen Rolling Stock Co Ltd., China Coal No. 5 Construction Company, Jiangdu Tianan Machinery Co. Ltd., Jiangsu Hongda Special Steel Machinery Plant Corp. Ltd., Yapp Automotive Parts Ltd. etc. 9. Many Indian companies have set up manufacturing units in Jiangsu. Dr. Reddy’s Laboratories has set up a manufacturing unit in Kunshan. Mahindra Satyam has established its largest software development centre outside India in Nanjing. Mahindra & Mahindra has acquired a tractor manufacturing facility in Yancheng. Laxmi Machine Works (LMW) has established a wholly owned subsidiary LMW Textile Machinery (Suzhou) Company Ltd has established its own manufacturing facility in Suzhou. Wipro has set up Wipro Infrastructure Engineering Machinery (Changzhou) Co. Ltd. in Changzhou to manufacture hydraulic cylinders. Harsha Engineering has set up Harsha Engineering Components (Changshu) Co. Ltd in Changshu. Sterlite has set up Jiangsu Sterlite Tongguang Fiber Co. Ltd. in Haimen to manufacture and distribute optic fiber used to produce fiber optic cables. Havells Sylvania has entered into a JV with Shanghai Yaming Lighting Co. to establish a Greenfield manufacturing facility to produce energy efficient lamps in Yancheng, Jiangsu. Tata Jaguar Land Rover (JLR) has entered into a JV with Chery motors, which has established a manufacturing facility in Changshu. Aditya Birla Group Company Novelis has established a plant at Changzhou. 10. Consulate General of India Shanghai, in partnership with NASSCOM and Nanjing Municipality organized an India-China IT symposium in Nanjing in January 2017. More than 50 leading Chinese companies from sectors including the intelligent equipment manufacturing, aviation engineering, smart grids, energy saving and environmental protection technologies, new generation cloud computing participated at the event. Indian company representatives of Infosys, Wipro, Tech Mahindra, TCS, HCL participated in the session. During the India culture week at Zhenjiang, a new website- CHINDIA360 (www.chindia360.com ) was launched. The website aims at providing all necessary information to potential Chinese investors looking for investment opportunities in India. 11. Jiangsu has been very appreciative of Indian culture especially Indian music, dance and Yoga. In the year 2016-2017, five India culture week celebrations were conducted in Jiangsu (Wuxi 27 march 2016, Yangzhou- 23-29 September 2016, Zhenjiang- 16-24th March 2017, Nanjing- 22-26th May 2017 and Suqian 24-29th May 2017). The India week presented a complete flavor of India including India food festival, Indian film festival, Painting exhibition, Business event and a gala culture show with troops from India sponsored by ICCR. During the India culture week at Zhenjiang, an exhibition on Buddhism was jointly inaugurated. The photo exhibits display prominent Buddhist sites/monasteries across India. Colors of India musical program was organized in Nanjing, Suqian and Wuxi in 2017. The two hour long program showcased both classical and Bollywood dance performance bringing together a unique and vibrant flavor of India. The classical dance performance titled ‘Charishnu’ was led by Ms Leela Samson and Bollywood performance was organized by Teamwork Arts. 12. The International Day of Yoga was held in 10 cities across Eastern China and 2016 and 2017 under the theme “Ten cities, ten days, bringing together 15000 Yoga lovers closer to India- promoting healthy and harmonious lifestyle”. The event was also organized at Zhenjiang (11th June), Suqian (23rd June), Xuzhou (23rd June) and Taizhou (24th June). The most notable was the event in Wuxi (25th June) which brought together 10,000 yoga lovers to perform Yoga in the Lingshan Buddha temple on 25th June 2017. 13. There are over 400 Indians in Nanjing including 115 students at Nanjing Medical University and 130 in South East University. There are also 470 students in Suzhou Medical University, 210 in Yangzhou University, 100 in Zhenjiang Jiangsu University and 260 in Nantong Medical College. 14. Jiangsu is crisscrossed by rivers, canals and lakes, which along with numerous historic sites holds great attraction for tourists from all over the world. Tourism in Jiangsu revolves around three major tourist centers, namely the Yangtze River Area, the Lake Taihu Area and the Xuhuai (Xuzhou and Huaian) Area. Nanjing, the capital of Jiangsu, was also the capital of six Chinese dynasties and contains a variety of historic sites that include ancient ones such as Nanjing Confucius Temple, Ming Dynasty City Wall and the contemporary ones such as Sun Yat Sen Mausoleum etc. Suzhou, which is located in the south east of the Jiangsu province, is known as the ‘Venice of China’. The city is renowned for its “Wu” Culture, the traditional ‘checkerboard- black tile, white wall’ architecture and the classic ‘rock and water’ gardens. Nine gardens in Suzhou are listed as World Cultural Heritage Sites. Xuzhou is famous for Han Dynasty (206BC-220AD) Terracotta Warriors’ site and Wuxi has an 80 meter high bronze Buddha statue built in 1996. The water towns such as Luzhi, Mudu, Tongli & Zhouzhuang, and Lakes such as Slender Waist Lake of Yangzhou, Lake Taihu of Wuxi, modern bridges sprawling across the Yangtze River and the older bridges across the ancient canals are also major tourist attractions in Jiangsu. The new construction such as the Lingshan Buddha at Wuxi has attracted tourists around the world to appreciate the grand new architectural wonders of China.